For some reason that I can't put my finger on, I was nervous to make this recipe. I'm not crazy about the strong, burnt flavor of sesame oil (which was used in the dressing), and I've made a dish similar to this in the past that I ended up throwing out...so imagine my surprise when I couldn't stop eating this. This was meant to be made the night before for lunch for the week, so I didn't plan on actually eating it right away. But I took one bite...and there went my previous dinner plans. The sesame oil flavor isn't strong at all, and the saltiness of the soy sauce and sweetness of the rice vinegar definitely are in the forefront. 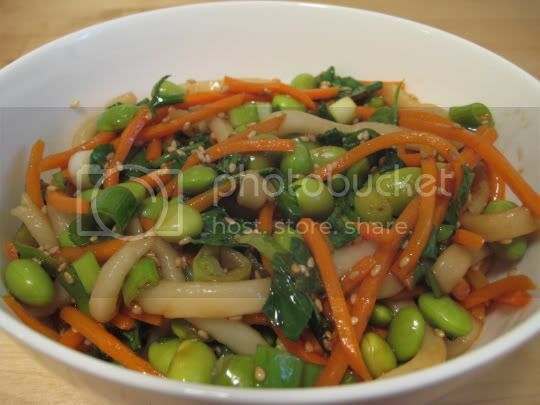 The veggies in the dish (especially the carrots) were the perfect texture (tender, but not mushy...firm, but not crunchy) and were a nice complement to the big, soft udon noodles (I used the precooked, soup-base kind...without using the soup base). And the dressing was perfect. Only one word of caution: the oil and sesame seeds in the dish and a ton of fat...16 grams per serving. And those udon noodles add a ton of calories! Make again? Definitely...no changes or additions. And leftovers were great.